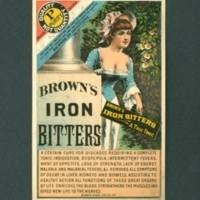 This chromolithographed trade card is advertising the product Brown's Iron Bitters from the Brown Chemical Company. 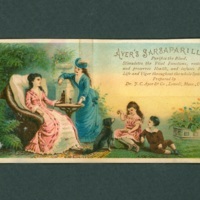 This trade card advertised a popular cure-all of the Victorian era (and later a popular soda fountain treat), sasparilla. 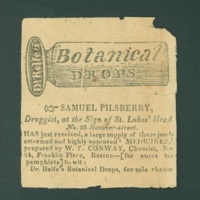 This is a late eighteenth-century advertisement for Dr. Relfe's Botanical Drops. It does not specify what condition(s) the medicine is supposed to treat. The broad term "botanical" suggests a concoction of herbs, perhaps intended as a cure-all. 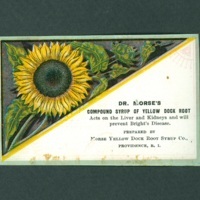 This trade card is an advertisement for Dr. Morse's Compound Syrup of Yellow Dock Root. 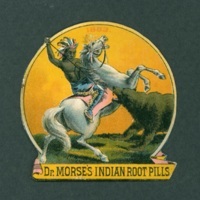 This Dr. Morse is different from the Dr. Morse of Indian Root Pills fame.